When it comes to music, album art is a big part of the fun. But what if you’ve got hundreds of albums with no cover art? Read on to see how you can track down the correct art for each. 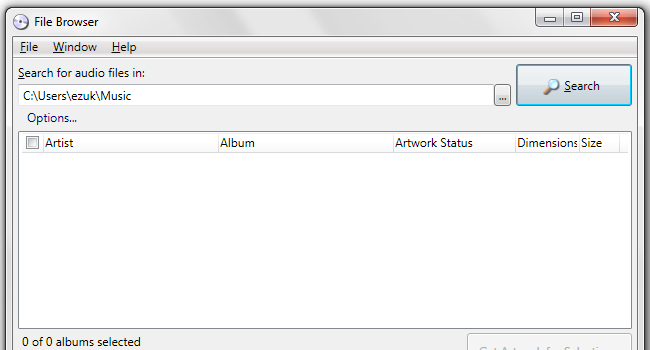 We’re going to be using a free application called Album Art Downloader. It’s got an unconventional interface, but it works very well. To get started, click the link, download the application and install it. For this tutorial to work, you’re going to need a very neat, orderly music library. Each album should reside in its own subfolder, and the files should all have correct metadata so that Album Art Downloader knows what to search for. 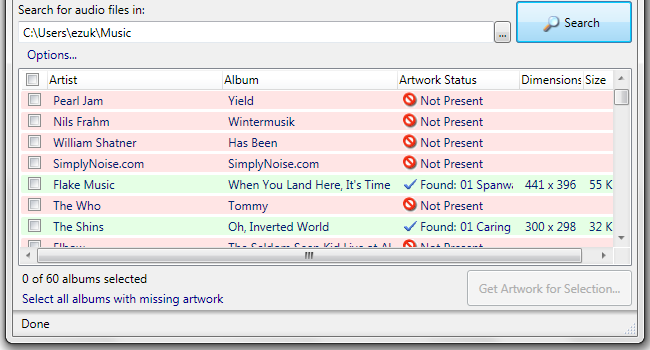 If your house is in order, great; but if you need a bit of help getting there, check out our previous post showing How to Clean Up and Fix Your Music Library with the MusicBrainz Database. Once your library is all neat, move on to the next step. Feel free to disable any other sources you don’t think you’ll need in the process, just like we’ve disabled Take2 and Yes24 above. From our experience, Amazon and Google Images are usually enough to track down most albums. 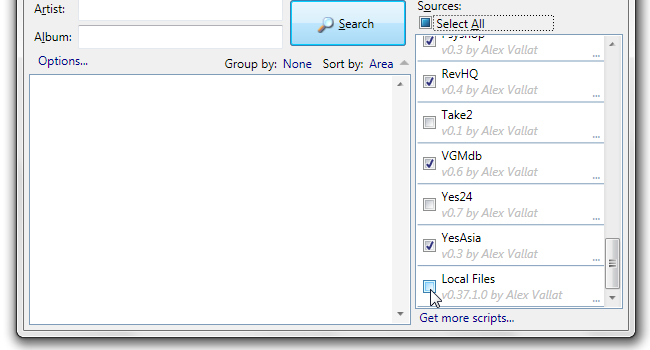 Another thing you should do at this point is set the “Sort by” listbox to “Area”, as shown in the screenshot above. This would ensure the largest images would float to the top of the search results. Now that we’re all set, it’s time to point Album Art Downloader at our music collection and tell it what it should fetch. Go to File > New > File Browser, or hit Ctrl+B. 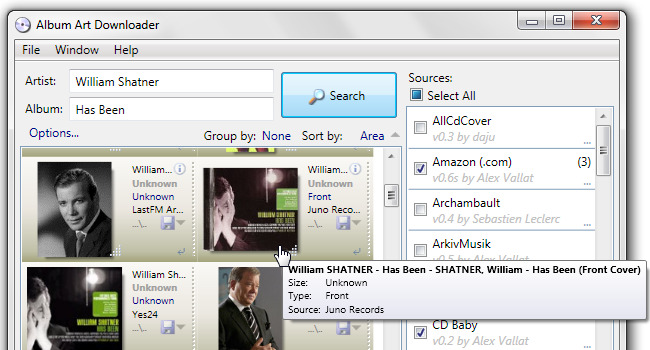 The File Browser is a separate window; that’s what’s odd about the Album Art Downloader interface – it uses lots of separate windows that pop up all over the place. Once you get used to that, the application is very easy to use. 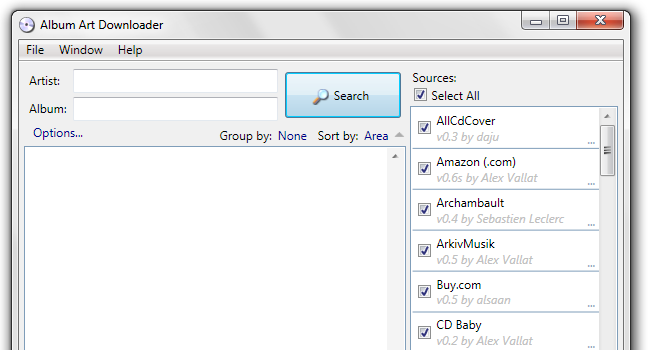 Point the File Browser at your music library (C:\Users\ezuk\Music above) and click the large Search button. Album Art Downloader will go through your entire music library quite rapidly, looking for the artist name, album name, and whether or not the album already has artwork. 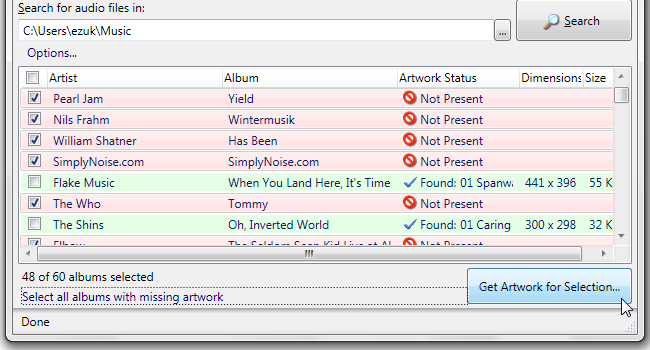 Click “Select all albums with missing artwork”, and then click Get Artwork for Selection. 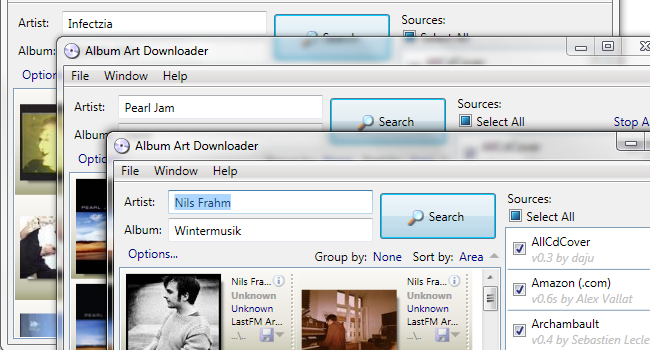 Album Art Downloader will now pop up three separate search windows in parallel. Do not be alarmed – the application is just trying to save you time. Since searching through multiple image databases tends to take some time, working in parallel is efficient: While you’re busy sorting through the results of the first search, the other two are already fetching images. By the time you’re done with the first search, the second one is ready for you. Let’s start sifting through the first one. The thumbnails are tiny, but you can click and hold a thumbnail to pup up a full-size version of the file. You can also drag the line alongside each “tile” to make the tiles larger. Once you’ve tracked down the correct album art at a good resolution, double-click the thumbnail or single-click the diskette icon. A file called “folder.jpg” (or .png, as the case may be) will be saved in the folder containing the album. You’re done! 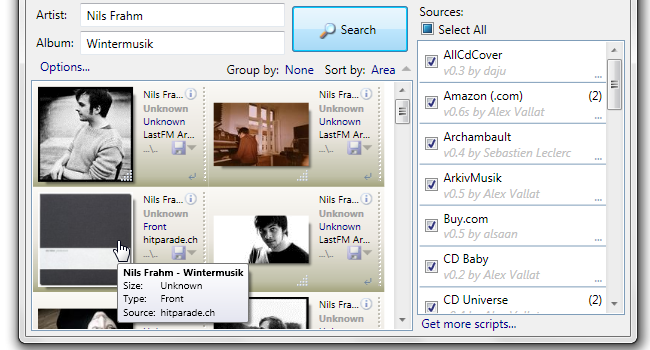 Close the search window, and a new one will pop up, searching for the next album. Don’t wait for this window to fill up with images; just switch to one of the other two windows waiting for you, pick the correct image, save, and close. Rinse, lather, repeat. In no time your music library will be full of beautiful, high resolution artwork!